In an economic environment struggling and grappling with depleting margins and lower than natural growth, there is one industry which seems to be bullish and buoyant. The tourism industry across the globe has been seeing a steady rise in traction in the past 18 months in spite of the global slowdown. 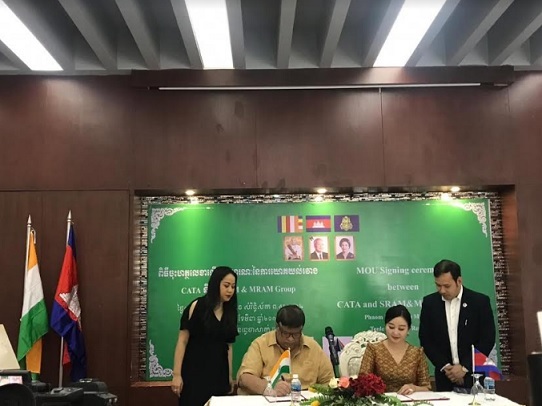 SRAM Holidays, the travel arm of the SRAM & MRAM Group has announced its tie-up with CATA (Cambodian Association of Travel Agents) to augment and strengthen the tourism and travel industry of Cambodia. Speaking at an event, Dr Hiranandani, Chairman, SRAM & MRAM Group emphasised that the challenges ahead for the Travel & Tourism industry in 2019 will be to figure out how to create tailored customer experiences when there is mass customization of experience across all travel operations across the globe vis-a-vis destination, advertising, and brands. "This will proliferate exorbitant amounts of data about their preferences, relationships, habits, locations, etc which would a great mining opportunity for big data analysists like SRAM to use this data to hyper target our customers with specific travel destinations as per the need, demand and preference of the customer along with advertising and optimize the customer experience based on the analytics provided by our data mining division. With this launch, we intend to enter the high octane travel and tourism industry in the ASEAN and specifically tailor-made packages for the Cambodian markets," he said. Chhay Sivlin, President CATA, was all praise for both SRAM & MRAM for trying to transform the Cambodian Tourism Industry which she says is contributing the maximum to the overall Cambodian GDP. Silvin has been recently praised by none other than His Excellency, The King himself that she has been managing the entire operations of CATA so efficiently that the tourism figures have been steadily on the rise in the past 3 years since she has taken over, the company said in a press release. These figures need to go higher and this association will help the local talent pool to grow and showcase their wares and ensure they can be counted among the best in the near future, it added. Sivlin, has also assured SRAM & MRAM group that she will provide the necessary permissions to conduct prayers and other ways of worship at the Kulan Mountains in Seam Reap, Cambodia a religious heritage site with over 1008 Shiva Lingas and also a religious site for Hindu tourists. She is happy that SRAM is willing to conduct road shows to promote Cambodia as a tourist destination and help Cambodia see an influx of tourists from across the world. Rahul Shah, Director, Master Tours, and partner director in the SRAM & MRAM groups travel division praised the opportunity provided to them to expand their wings to Cambodia from their traditional European and ASEAN regions. As the current managing partner in SRAM Holidays, a travel and tourism portal in Cambodia and after having successfully launched and managed multiple destination management companies (DMC's), Rahul Shah said he was extremely positive about the prospects and proudly takes responsibility to increase the Cambodian Tourism contribution to the GDP by around 2% in the coming years. Rahul Shah added that for him attracting Hindu tourists from across the globe to come to Cambodia is his first priority. He wants to create awareness among the global Hindu Diaspora about Angkor Wat and Kulan Mountains. Mary Mam, Director, SRAM & MRAM group, said that it has been the groups' endeavour to promote Hindu tourism as Cambodia and India share a rich cultural heritage. Rithy Leksin, Executive Director, SRAM & MRAM and the man behind creating the association between SRAM & CATA is extremely excited about the new development. He said the wheels of instruments need to move towards technology-driven tourism exchange between the various countries. Nitin Gupta, technocrat and inventor, and the man behind an energy revolution when he invented a dry cell-based technology has pledged to develop a tourism exchange in association with SRAM & MRAM to help promote and ease operation of the tourists and the members of CATA. SRAM has plans to invest heavily in IT, Infrastructure, construction and a host of other business verticals and wants to contribute its might for the betterment of the Cambodian people as it has been doing for over a decade now.